Author: Joseph A. McIntyre. Series founded by: Johannes Lukas †. Series edited by: Hilke Meyer-Bahlburg, H. Ekkehard Wolff. 22 pp. Roman, 347 pp. Verbal compounds abound in the Hausa language. 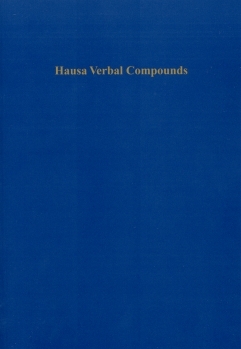 Starting with a broad definition of a verbal compound – a compound with a verb – the author describes and analyses Hausa verbal compounds, most of which have a verb as first member (chapter 2); three other kinds of verbal compound are also described: compounds beginning with a (TAM) pronoun complex, with a prefix (here, there are both singular and plural compounds) or with a nominalised form of the verb (chapter 3). In chapters 2 and 3 compounds are presented according to their internal syntax (sometimes quite complex) and described in terms of the phonological and morphological features found in these compounds. Two such features affect the tone of the verb; one feature affects the final vowel of the noun direct object in two-member compounds. Unmarked compounds are also discussed. In chapter 4 the functions of phonological and morphological features are critically analysed and new insights offered. The discussion in chapter 5 centres on a particular kind of verb (the so-called grade 2 verb): here, the idiosyncracies of these verbs in verbal compounds are described and an explanation offered. Chapter 6 focuses on the kinds of relationship between the literal and lexical meanings (the latter mostly opaque) of the compounds. The various relationships between the two meanings are systematically described in terms of metonymy, metaphor and other rhetorical devices. A first set of appendices describes various external features of Hausa verbal compounds: their status as (mainly) nouns as well as gender and number; a second set lists more than 960 compounds according to compound type and internal syntax. An important feature of Hausa Verbal Compounds is the description of Hausa verbs: this differs radically from the so-called grade system and is offered, at least implicitly, as an alternative to that system. [...] the thesis by J. McIntyre is a milestone in furthering research on a very sensitive matter of the Hausa verbal compounds. It supplements existing Hausa dictionaries and, therefore, is a very useful pedagogical tool for foreign Hausanists, epecially for students.